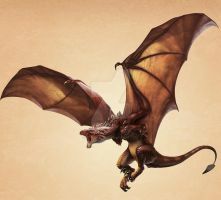 Swiddy's Skywyrm... I always liked the striking black and white original pattern, and thought it would look nice with the new bump map, so I combined the two. I wanted to show a thumbnail of the copperhead at the top of this comment but I could not because I don't have a premium account. Absolutely awesome! I've been wanting to get Swidhelm's skywyrm a long, long time. Finally getting it this week. Your image alone would compel a person to get this dragon. Seriously, that image is excellent. There's such an obvious ferocity and territoriality here. Thanks! I aught to get around to more texture tweaking on this one sometime, it's a good, solid model. Looks great! The pose, the pattern of the skin, blur on the body... It looks as if it was a shot from a film. I just love the markings. This combination of black, white and red makes a striking impression of a dangerous fellow one don't want to cross paths with. Nice DOF on this one. Swiddy makes some of the best dragons, no? Thanks... it blurs out some of the details on the bump map... which was absolutely necessary on the first version, but this version could have gotten away with less. That's AWESOME!!! Looks so real!!! Thanks! That's what I was trying for... glad you like it! Very impressive look... I like this alot. Thanks, it was one of my favorites from a while ago, I had to re do it, especially now that I have a better bump map for the scales. I like the way there's thread of saliva in his mouth, really adds a level of reality to it. Thanks, was one of my favorites too, so I had to re do it. I'll probably re do it again sometime. I love your pictures (though I think this might be my favorite of all your work), How on earth do you do them? Cool I have never heard of that program but it looks cool. Thanks, I like how the scales came out. That's so awesome!! I love this pic, srsly. The texture is so nice! Thanks! The texture is Swiddy's, I just modified it a bit. It's one of the original two that came with the model, but the original scale pattern was somewhat net-like. He later released an expansion with a bump map that looked more dinosaur-scale like, so I took the new bump map, tweaked the base color to match the black and white one, painted the dark markings onto it with several layers (2 color burn, 1 multiply, 1 inverted high contrast lighten) and hey presto, old markings, new scales. Wow! You've really captured a sense of fierceness. The saliva strings are what really makes it pop for me.